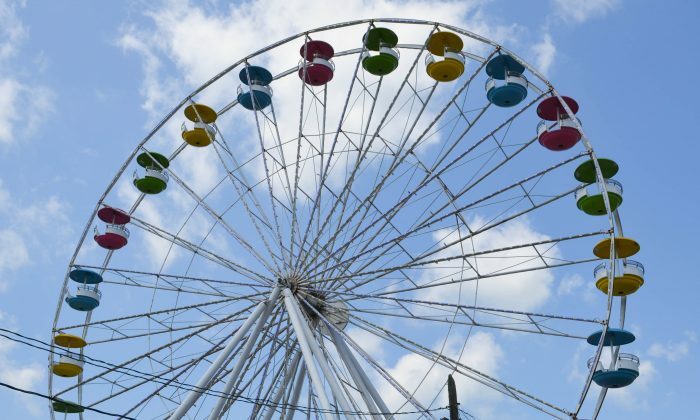 WALLKILL—The lights on the Ferris wheel were already on, and stuffed animals hung from game booths on July 19, one day before the start of the annual Orange County Fair in Wallkill. Fair General Manager Mike Gurda, who is the third generation in his family to run the fair, said the only thing he was worried about for opening day is if the weather would cooperate. “You always have to watch the weather,” he said. Ticket sales have stayed steady over the years, he said, but to entice more people to come, they are offering more deals this year, like $2 Tuesday and Carload Night for $60 per car, with rides included. There will be musical performances, produced and hosted by local musician Carl Richards, and fireworks shows on July 22 and 29. For animal lovers, there will be a Jungle Habitat Indoor Safari and a Gigantic Petting Zoo with animals like sheep, buffalo, donkeys, longhorn cattle and more. As for the rides, which are run by Strates Shows Inc., Gurda said they are almost all the same as last year, with the exception of the Sky Flyer, a tower-like structure with swings that spin as they rise to the top. In terms of automotive entertainment, there will be stock car racing, a demolition derby, and motocross on the track next to the fair. There will also be an antique fire truck show, which includes some engines that were used during 9/11. The fair runs from July 20 to 31 from 4 p.m. to 11 p.m. on weekdays and 1 p.m. to 11 p.m. on weekends. For more info or to contact the fair, visit orangecountyfair.com or call 845-343-4826. On July 21, this article was updated with the correct location of the fair. Epoch Times regrets the error.